It's such a dream, the Family Dinner. From the moment I saw my first ultrasound, I could see it so clearly. A happy family sits around a table, passing heaped platters of colorful food. It's such a dream, The Family Dinner. From the moment I saw my first ultrasound, I could see it so clearly. A happy family sits around a table, passing heaped platters of colorful food, digging into a juicy roast chicken just as someone says something hilarious. There's probably a freshly baked biscuit in there, and definitely a glass of wine. Cut to our real life: There's a round-faced guy who only eats puree, two booster seats and a cup of milk that just hit the floor. As a new friend pointed out to me the other day, "Oh, you're in the thick of it." But it still works well enough--and we do it every night. To set the stage, we are a five-person family including three children under four. We are also obsessed with eating as a family, and living to tell about it. To that end, I have a million ideas, hits and misses on my blog, Foodlets: Mini Foodies in the Making...Maybe. We've been in the trenches for the last few years, figuring out how to balance this idea: eating together when the kids are still too young to hold utensils, let alone adopt "manners", yet starting early enough to instill a family habit. Why it matters: Studies have shown that kids who eat together with their parents have lower rates of everything from obesity to drug problems and get all the good stuff instead, including higher SAT scores. So says Time magazine plus Harvard and Purdue Universities, among others. And in an era of increasingly serious illnesses related to diet, teaching kids about food, how to prepare it, cook it and eat as a group is also a valuable life skill. So says Jamie Oliver and The Washington Post among others. Also, I think it's nice. (And so does Michelle Obama.) But like anything with a toddler, it's not easy. So, I've tried tons of things and asked around. For me, each meal's strategy usually boils down to a complex equation involving the number of tantrums we've had that day and my level of caffeine intake, but to each his own. Here's what works for us, and others who know much more. 1. Make one simple meal for everyone. 2. Follow the one bite, no stress rule. For our young brood, one bite is a reasonable ask. I don't believe in forcing people to eat things they don't like. But I do believe in trying something before writing it off, Green Eggs & Ham style (which we reference all the time.) Here's the secret: don't make it a big deal. You may have to repeat the rule several times, but don't offer anything else and don't raise your voice. Just carry on. Eat your meal and every so often offer a bite. Sometimes I offer a fork full of my food, because somehow Mom's plate is always more delicious. Even when you face opposition of the arms-crossed variety, don't give in. Amy Keith Gubner, a mom to two boys in New York, told me that she used to worry about her toddler when he refused meals. Would he get up at 5am if she didn't offer a cup of yogurt instead? Turns out, he slept just fine. Start with a 5-minute warning because we all know how transitions go with toddlers. (It's almost time for dinner! sounds much more fun than I said, no more iPad!) Around this time, divert attention away from hungry bellies to a growing sense of pride by letting them help set up plates, silverware and definitely napkins. 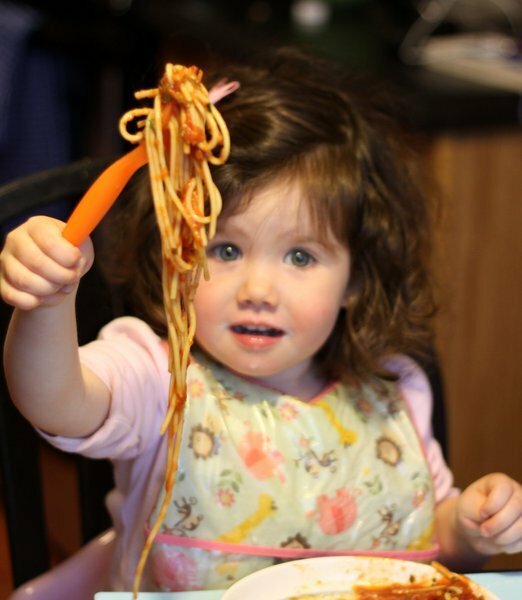 To that end, even a two-year-old can help make dinner (or any meal). Required tools: a stool and an extra few minutes to allow for doughy hands that haven't had much practice yet. Tasks for our tiny people include making piles, putting chopped fruit or veggies on a pan, stirring (supervised or this will happen), sprinkling cinnamon sugar onto baked apple slices, sifting flour for muffins, and believe it or not, breaking eggs. I've used veggie cutters to produce hearts and stars on spinach salad and made miniature versions of everything from the Barefoot Contessa's meatloaf to mashed potatoes from 101 Cookbooks. 8. Load up a tray. Karen Le Billion says in her brilliant book, French Kids Eat Everything, that when she first started trying to sit down together as a family, she'd "prepare as though she was going on a long car trip", thinking through the meal ahead of time and packing everything she'd need at the table. This prevents parents from popping up and down all meal long. I use a tray and while it sounds subservient, it's a huge time saver. Things that keep me from running back to the kitchen: a paring knife for any bites that are too big, a wet paper towel or washcloth, a carafe of water or the milk jug itself. A sticker system works. Dessert works, too. See below. 11. Make the rules clear. At our house, everyone has to try one bite of everything, at every meal. It's all very calm, there's hardly ever anyone screeching this rule aloud. You're simply not eligible for dessert (or whatever reward your kids are going for) if you don't. 12. Keep your expectations low. It's going to be hectic. Will someone whine? Yes. Cry? Possibly. Spill their food? Absolutely. Take it in stride and know that the more you do this, the better it'll get. Decide what you want to focus on first, and for most of us, this is actually getting some food into the kids. Then move on to sitting for longer periods. If the toddler is making frustrated noises with her fork, let her just pop that bite into her mouth with her fingers. Keep your eye on the prize: a smooth family experience, not etiquette school. And since its your house, you get to decide what the difference is and when to tackle each. 13. Keep the meal short. For some kids, especially if this is new to your crew, the idea of sitting still for 20-30 minutes is torturous. If you've got an ants-in-his-pants kind of kid, don't insist that everyone sit down until dinner is really served, which will cut back on total chair time. Hayley Krischer, an award winning parenting blogger at Femamom, says they've used a timer to set realistic expectations all around, and make the meal feel more like a game. 14. About dessert. Since it's nighttime and these are small children, we don't do a lot of decadent desserts. It's usually fruit, fresh or dried, or some kind of low sugar treat that I'm trying out on Foodlets. This week we made a no-cook coconut milk and chia seed pudding that the girls devoured. I was totally shocked by this success but won't argue one bit. This is the big one. A habit takes time and while this is a first world problem, that doesn't mean it's not hard. Sometimes we have a great little evening. Sometimes we don't. We're still doing it again tomorrow.